Looking for an easy way to help with PTSA fundraising? Shop at any of these stores, and a portion of your purchase will be donated to KiMS! Your school, teachers and students thank you for donating to the PTSA! Turn your grocery shopping into funds for our classroom by getting a PCC Scrip Reloadable Card. 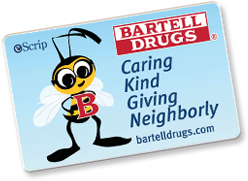 The Scrip card works similarly to a gift card - it is free to join and a card load of $25 will get you started. By taking just a few minutes to enrol, our beloved KiMS will earn 5% back on every purchase you make using the card; these funds will support the PTSA's student and teacher enrichment initiatives. For more information and/or to sign up, please contact Erika Tipp.